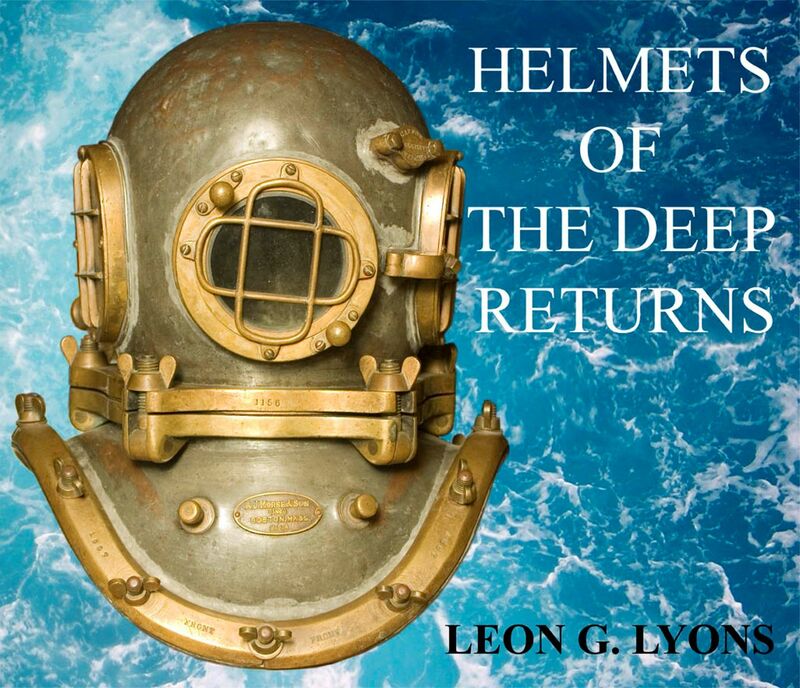 Currently it looks like Leon Lyons’ new book “” HELMETS OF THE DEEP, RETURNS””after a long time of preparation and delay, due to a serious health issue, will be edited in the beginning of 2011.
completed with more images and information, that has come available since then. and the limited series of 200 pieces in a luxury leather bound wrapping. and Euro 780 for the luxury copy). The Netherlands, the import taxes and VAT to be quoted within the European Community. Each book shall be provided with a number and be delivered with a certificate, personally signed by Leon Lyons. As might be supposed, the distribution in Europe takes exclusively place by NAUTIEK. that as such under the restriction that the number will still be at disposal. Currently there’s good progress going on with the preparation of the book. Leon Lyons, assisted by the photographer Spring Saldana, are working together on making the last series of the layouts for the book, with the page count at present, reaching 1200, with more to go. The planning is that this part of the work can be completed around the end of November / sometime in December. The order to the printer, with the making of the down payment, to start with the purchase of the raw materials, which takes approx. 8 weeks, will be made during that period. In the meantime the correction procedure is on it’s way, and is planned to be ready around the end of this year. The actual printing and binding process will take two to three months, so that can be expected that the books are available for transport to the USA and The Netherlands in the begin of April, not counting on any unforeseen delays. Logistical preparations are being done before, to achieve a soon as possible, delivery to the customers that have reserved one or more books. The final retail price of the book is not known at this moment, just like the final costs of printing, as they are dependent on the still unknown amount of pages, the actual material needed, the production costs, and like the expenses for airfreight, import- and handling costs in the countries of destination. Also unknown, will there be any changes in the exchange rates of the US Dollar and Euro. Like I informed you before, the basic retail prices of the book (excl. V.A.T. to be calculated in the European Community), distributed from the USA, and The Netherlands, will be on the same level. The provisional estimation of the basic retail prices are according to the exchange rates of August 29th 2010 US Dollar 500 / Euro 390 for the standard copy, and for the leather bound version, US Dollar 1.000 / Euro 780. To secure your reservation, that I have considered as being without commitment, As soon after the actual printing process starts, an invoice is sent to you with a request for a down payment of Euro 200 for the standard, and/or Euro 400 for the leather bound book, to be paid within a month. This payment in advance will be settled in the final invoice that contains the V.A.T. (so far as this has to be quoted) and delivery costs (insured postage parcel). The final invoice will be sent, anticipating of the receipt of the money transfer to our bank, followed by the dispatch of the sending. HDS UK members, living in the UK, who made a reservation for books, will receive the invoice by intervention of the HDS. The sums due for the deposit, as well as for the final balance are payable to the account of the this organisation. On receipt of the final payment., the HDS will distribute the orders in England via a suitable parcel service. For HDS UK members, living outside the UK, the invoicing, way of payment and shipping procedures shall be settled direct by NAUTIEK, The Netherlands. Customers in France, who have made reservations and made already a deposit at Jean-Pierre Arguel, will receive the final invoice direct from and are payable to NAUTIEK, The Netherlands. The sum due is calculated on basis of the payment for the order, incl. T.V.A. plus sending costs, reduced with the deposit. On receipt of the final payment, the books will be sent from Castres, France. In case of having to cancel the order, due to unforeseen circumstances, after having submitted the down payment, this full amount will be refunded after receipt of a written request. Payment indications will be mentioned on the invoices, sent by NAUTIEK and the HDS UK. Costs of payments, to be done by bank transfer, are for account of the customer. In the process of the publication of my book, Helmets of the Deep Returns, there is again a delay of maybe four more months to be finished, from this date, of May 15, 2011, caused by the worker / helper, who is doing the photography and computer layout work, requesting some payment for time already spent, and not agreeing to the original verbal agreement of being paid when the work on the book is completed. Partial payment has been forthcoming, with now a written and signed agreement to having the book project completed in a timely fashion. With news that the publication amount of books has been cut in half, just 800 normal copies, and 200 of the leather bound editions, many of the people on the author's list who have yet to make their payment for the book, have been now sending in the funds, so as not to be left out of being able to acquire a copy. Since the publication of the first book, there are maybe ten times more collector's out there, with the interest of hard hat diving, and now with the cutback on the amount of books, most likely, as the books will be shipped, they could very well be all sold out. This cutback has been done, because of everyone on the author's list, who had not sent in their payment, and having to still be waiting for the banks to come across with a loan, to cover the needed amount of money to have the book published. One thing to remember, half of the amount of books are destined to NAUTIEK in the Netherlands, the HDS in the US, the HDS in the UK, and a couple of other countries, which means payment for these books, only comes about when the books are being delivered, so which shows the financial shortfall of funds needed to have the project paid for. As of this date in time, a personal loan has been offered to the author, thereby offsetting a bit of the amount of money that is needed, which comes in a most critical period in time of how the world's economy is doing. So I am deeply grateful to everyone in awaiting the coming of my book, for it has not been easy for me, especially most of the year 2010, in dealing with a critical medical issue. But all is on track now to reach the conclusion of this project. Like you can read in the here-under attached email-message by Leon Lyons, there has been delay of circa four months before the order of the book HELMETS OF THE DEEP RETURNS can be given to the printer. The delay is caused in the preparation process by overwhelming circumstances and some problems with the assistant, who does the photographing works and layout, that are solved in the meantime. The expected time, needed for printing and transport is estimated to be another three to four months. The amount of down payments by people who had made a reservation for one or more copies at Leon Lyons for an estimated price of US$ 500 for each standard book and US$ 1.000 for each leather bound version remained – despite a second request - behind the expectations. For this reason Leon decided to reduce the amount of books to be ordered to 1.000 (800 x standard copy and 200 x leather bound version), taking the line that those who had reserved, but not had paid until that moment, will not be considered any more as being reserved and scratched from the listing of the book. Everyone, who reserved direct to NAUTIEK or indirect via the Historical Diving Society UK, Poland and Jean-Pierre Arguel in France will receive on the date, when the order to the printer is given, an invoice for a down-payment of Euro 200 for each ordered standard book and Euro 400 for each ordered leather bound book, to be paid within 30 days. Should the down payment not take place within this time frame, then it will be concluded that the order is cancelled. As soon as the books are available and the final price is known, a second invoice is sent out to the those, who made the down payment, like mentioned under a. for the final payment plus packing and sending costs by registered mail, again to be paid within 30 days. The presently indicative estimated prices of US$ 500 for each standard book and US$ 1.000 for each leather bound book are excl. packing and postage and can be subject to due to currency variations between the US$ and the Euro. The final price per book, including the transport costs from the printer, import taxes, custom and handling duties, are currently not exactly known and will be quoted when the definite figures are known. The final price per book, delivered by NAUTIEK is equal with the price, maintained by Leon Lyons, in this case converted in Euro at the date when the books (250 standard and 50 leather bound) arrive at NAUTIEK. Books that are reserved at Jean-Pierre Arguel in France, will be invoiced by NAUTIEK and be dispatched with registered mail from Castres, France as soon as the complete payment is received on the account of NAUTIEK. The price of the books, ordered after August 1st 2011 will be increased with US$ 100 for each standard copy and US$ 200 (or an equivalent in Euro) for each leather bound version. Many people are during a long time looking forward for the publication of the book HELMETS OF THE DEEP RETURNS. as well as by unforeseen circumstances that affected the progress of the book. that he received from many larger and smaller collectors. Due to this overwhelming contribution, the book will contain nearly 2.000 pages. making the lay-out for the rest of the pages that as soon as they are ready will be inserted paragraph wise. The next step is renumbering the pages in the right sequence, before the concept can be sent to the printer. all subscribers will be informed. and 200 in the luxe version, for which currently over 550, resp. 170 reservations are received. Currently Leon is in the latest phase of the preparation of his book, finishing the last four hundred pages. they will subsequently be added, followed by the right numbering as part of the final lay-out. delivery time, and other conditions, based on the book's size, and the weight of 800 standard and 200 leather bound books. Expected is that around mid February 2013, the choice for the printer can be made and a firm order can be given. As soon as the weight of the books is known, and the costs of transport can be estimated, the provisional price per book will be fixed in US Dollars. price for the (reserved) book(s). just like the duties for customs are calculated. increased with V.A.T., costs of packing and postage plus insurance to the consignee. For the good order I inform you, that for books that are already reserved, the final price will be valid. The price of the books for those who have not made a reservation, will be 10 % higher.